The complex logistics of getting our valuable mineral exports from pit to port will be interrogated by about 60 year-seven Gladstone students. They will be mentored by industry experts and will present their solutions to the issues associated with moving $10.4 billion worth of minerals annually from mines and onto ships. “These experiences will help prepare our students for future skills required in our industry around optimised planning and data collection and analysis,” said Katrina Lee Jones Queensland Resources Council (QRC) Director Skills, Education and Diversity. “Australia Pacific LNG, operated downstream by ConocoPhillips, is proud to sponsor this event in Gladstone,” said ConocoPhillips’ Manager Communities and Sustainable Development, Rob Gibb. “The students will learn everything from fleet management to workplace health and safety, and product dispatch and wharf control,” he said. “We’re very excited to be part of this valuable workshop, which also helps to demonstrate the many different careers and skills needed in our resources sector. Schools taking part are, Gladstone SHS, Toolooa SHS, Tannum Sands SHS and Chanel College. 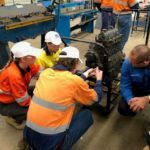 Staff from Australia Pacific LNG, Queensland Energy Resources, NRG, Gladstone Ports Corp, Boyne Smelter Limited and Queensland Alumina Limited will be assisting the students.